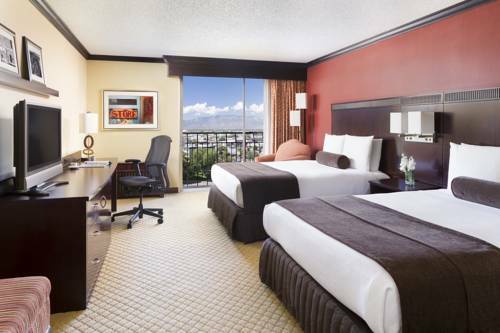 Welcome to the Crowne Plaza Albuquerque A property of the Intercontinental Hotels Group and a proud member of the worlds leading rewards program, IHG Rewards Club. The Crowne Plaza is situated on a 14-acre oasis in the University of New Mexico & midtown district that captures the unique flavor & artistry of the southwest. We are located minutes from the Albuquerque International Sunport, University of New Mexico, Lockheed Martin, Kirtland Air Force Base, T-Mobile, L3, BNSF, Presbyterian and Lovelace Hospitals. We are minutes from Historic Old Town, world renowned museums, National Hispanic Cultural Center, Balloon Fiesta Park as well as numerous diverse shopping districts. Centrally located at the crossroads of New Mexico, our hotel is your headquarters to go out and explore the best New Mexico has to offer! You can relax in our newly renovated guest rooms and executive suites. Entertain in one of our dining facilities, Stonestreet Grille, Cantina Bar & Grill, and the award winning Ranchers Club of NM. Enjoy our complimentary wireless Internet access, seasonal Olympic sized outdoor swimming pool, 24 hour fitness center, and business center. Whether youre staying with us for business or on vacation, the Crowne Plaza Albuquerque, NM will make you feel right at home. With over 26,000 square feet of meeting and event space and on-site professional Crowne Meetings Director, you can be assured your event will be a success. StoneStreet: Located lobby level, our restaurant offers a great variety of food for breakfast, lunch and dinner. Cantina Lounge: Enjoy a beverage while watching the game in our lobby bar, The Cantina. We offer a lighter fare food menu, great draft beer offerings, happy hour specials Sunday thru Friday, with indoor and outdoor seating. Cantina Bar and Lounge: Serves: Lunch and Dinner Enjoy a beverage while enjoying the game. We offer a lighter fare, happy hour specials Sunday thru Thursday with indoor and outdoor seating.